A student group at Georgia Tech says Sen. David Perdue (R-Georgia) grabbed a student’s phone when the student tried to ask about Perdue’s support for Brian Kemp, the Republican candidate for governor. In a now-viral video, Perdue is seen grabbing the phone from the student who is trying to ask a question. Video used with permission from the Young Democratic Socialists of America at Georgia Tech. 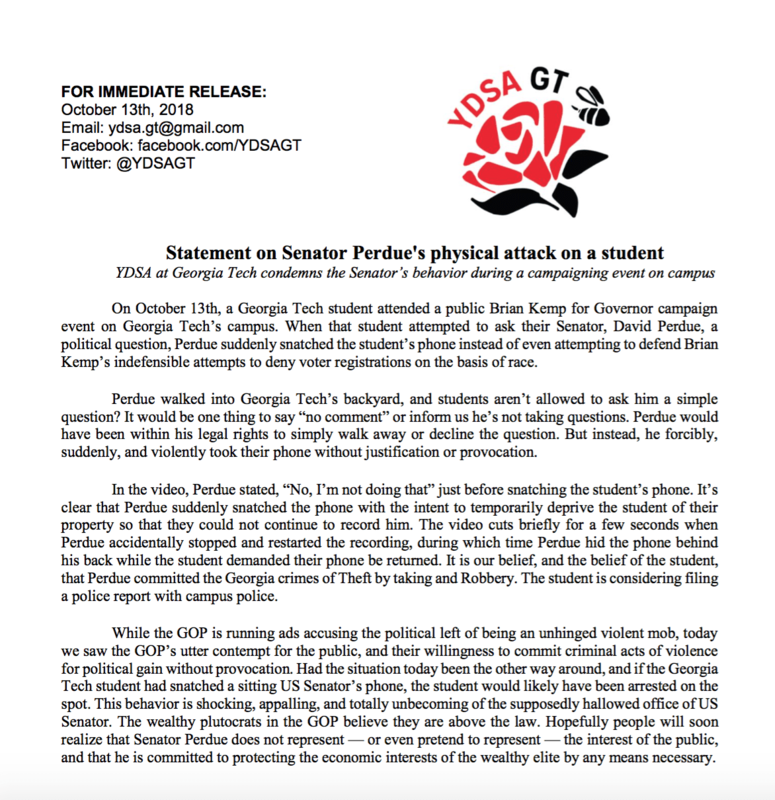 The Young Democratic Socialists of America group at Georgia Tech said that Perdue was on campus for a Brian Kemp event. A student asked Perdue about his endorsement of Kemp in the race for governor in light of the exact match voter requirement controversy. Phone video from the event shows the student trying to ask the question, when Perdue grabs the student’s phone. “Give me my phone back senator,” the student said in response. The video then shows the student being returned their phone while the Senator walks away. Perdue’s office staff said Perdue thought the student was asking for a picture and returned the phone when he realized he was being asked a question. The Young Democratic Socialists of America condemned Senator Perdue’s actions in the incident and said they believe he committed crimes of theft by taking and robbery. Kemp is Georgia’s secretary of state and has come under fire for the exact match rule, which has put some Georgians’ voter registration status in pending. Stacey Abrams, who is running as the democratic candidate, told us last week that tens of thousands of voter registrations are on hold. Janie Bohlmann is a senior majoring in journalism at the Grady College of Journalism and Mass Communication at the University of Georgia.